In late July 2013, Google released a new piece of hardware called the Google Chromecast, or just Chromecast for short. The thought process behind this new piece of hardware is to allow users to push, or cast, media to their television from their computing hardware so that it can be enjoyed on a larger screen or to share it without passing around the tablet or huddling around the smartphone or laptop. 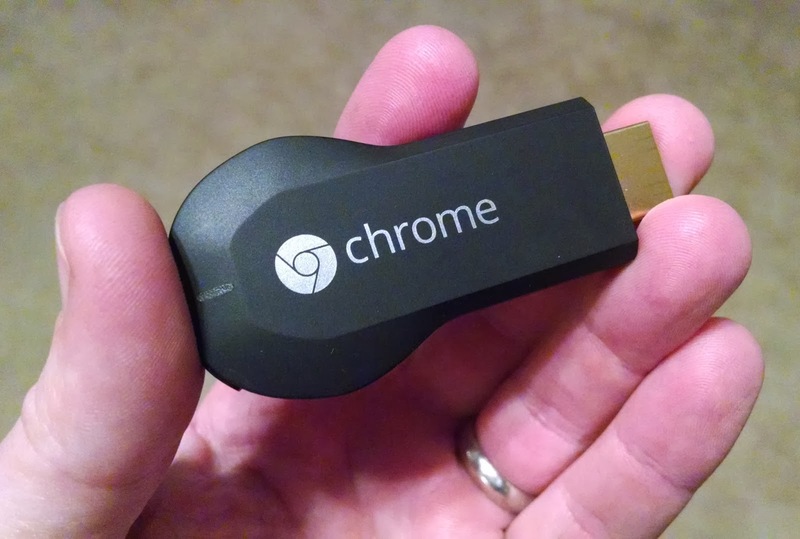 The Google Chromecast is a small dongle that plugs into an HDMI input port in your television. It is 72(L) x 35(W) x 12(H) mm and its shaped to look like a house or car key. It displays 1080P output. It only weighs 34 grams and it ships with 2 extra accessories in the box: a 4 inch extender that will allow it to fall flat against the back of the television set and not protrude out the 3 inches in length, and a USB plug. Yes, the Chromecast has to be plugged in for electricity. It’s not as annoying as it sounds but we’ll talk more on that later. Out of the box, the first thing you will want to do is make sure you have at least one available HDMI input port in your television. Before plugging it into that open HDMI port, make sure there is about 4 inches of space between that port and the closest wall or cabinet. If there isn’t, then you will need to use the extender that came with it. This extender will allow the Chromecast to bend and primarily fall against the side of the television so that you will only need about 1 inch of space between the television and the closest wall now. After the Chromecast is plugged into the television’s HDMI port, you can either plug the micro USB cord that came with it into an open USB port on your television or you can plug it into your wall outlet. Now, not all USB ports on a television actually provide an electrical current, some only read a USB flash drive. You will know the Chromecast is getting the proper power when the white light on the back comes on. There are 3 ways you can cast content to your Chromecast: Android smartphone or tablet, Apple iPhone or iPad, or the Chromecast extension on the Chrome browser on your computer or laptop. Google supports a Chromecast app for both Android and iOS devices. Go to the Google Play Store or Apple App Store, search for “Chromecast” then download and install the Chromecast app by Google Inc. We’ll go over the Chrome extension in a bit. This next step assumes that you have a Wi-Fi router up and running in your home. Because the point of Chromecast is to cast content via the wireless router to your TV. Turn on your TV and change the TVs input signal to that of the one you plugged in Chromecast. Make sure you phone is connected to the same Wi-Fi signal. Now, open the Chromecast app that you just installed on your phone/tablet. It will immediately start searching for any Chromecast found on the Wi-Fi network and when it finds one, it will list it on the screen with the phrase “Needs setup”. 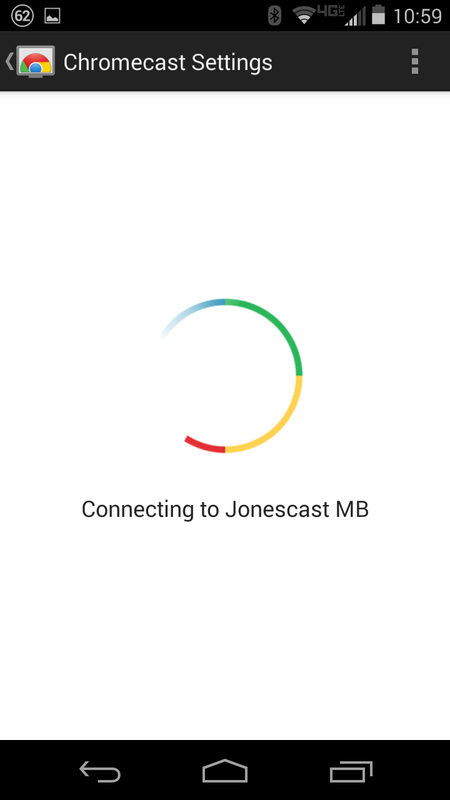 The next steps are easy: select the Chromecast from the list, confirm the passcode on the screen, give it a name, and connect it to your Wi-Fi network. BOOM! You’re ready to cast. There were originally only a handful of apps that would cast such as Youtube, Netflix, and Google Music or Movies. Now that the developer SDK has been released, developers are migrating the cast button into several apps. Pandora, Plex, HBO Go or Hulu Plus to just name a few. Once you are enjoying content in any of these apps on your phone or tablet, you will a small icon that looks like a box with a Wi-Fi signal in its bottom left corner. Just like the blue icon in the 3rdpicture above. Touching this icon will provide a popup allowing you to choose the Chromecast listing it by the name you provided during the setup process. When you select the Chromecast from this list, you will see that your TV starts to change picture. From your laptop or desktop, you will need the Chrome browser installed and then the Chromecast extension. This extension will be able to pick up the signal from your Chromecast throughout your Wi-Fi router. So your computer has to be on the same network. 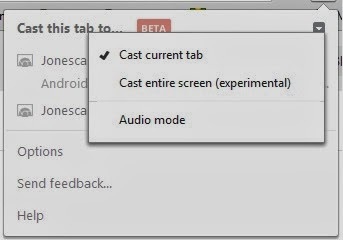 With the Chromecast extension in Chrome, you can cast the Chrome tab, your entire desktop. If you cast the tab, you can drag movie files from your file folders and drop them in the Chrome tab, then Chrome will cast that movie to your Chromecast. There are also websites that have enabled the Chromecast icon such as Youtube or Netflix. It’s important to understand that you are not streaming content via Chromecast. Instead your app tells the Chromecast what Youtube video you want to watch and then the Chromecast itself loads that video directly to your TV. Same with Netflix or Google Music. You are basically telling Chromecast where the content is and then it gets it for itself. This keeps the bandwidth usage lower, allows for clearer movies, and shorter buffering times. One of the biggest advantages is that it makes your dumb TV smart, but with limitations. From this authors perspective Chromecast is good enough to own 2. I have one in my living room, which is a smart TV, and another in my bedroom, which is not a smart TV. With Chromecast, near is no limitations in use based on whether or not your TV is smart. Another advantage is the easy of control from your smartphone, tablet, or Chrome browser. Being able to cast movies through Netflix or Youtube is very simple. Here is a link of apps that are currently Chromecast compatible. The Chromecast Developer SDK was released earlier this week, 2/5/2014, so more apps will be compatible very soon. You can cast live Youtube events, such as concerts or public speakers, through the Chrome extension, but not through the Youtube app. I recall reading that this is a copyright limitation. I’d like to point out that with Youtube you have a “TV Queue” and you can puts several Youtube videos into that queue before you start watching and then watch them back to back. I like this because I like to search a topic, pick 4-5-6 videos, put them in the queue, and then hit play. This keeps me from having to stop the search, watch, search again, watch, search again, watch…you see where I’m going with this. The Chromecast will also come in very handy if you are having a party or small get together where you would like music playing in the background. You will be able to control the playlist from your phone without having to walk away from a conversation. You can do this with Google Play Music or Pandora right now. More music app support is pretty much guaranteed. When you are not using Chromecast, it is still always listening. More so when it’s plugged into a wall outlet and not a TV USB port. 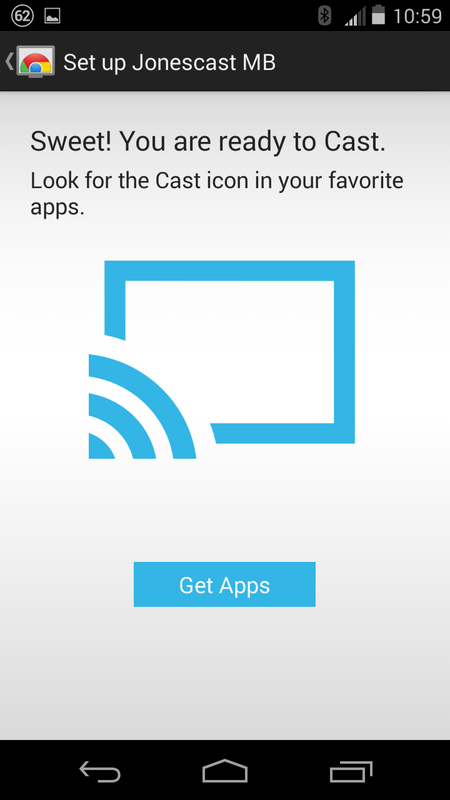 This will allow you to choose the Chromecast icon from your device, pick the Chromecast you want to cast to, and then that TVs input should change automatically. Also, when you are not connected to the Chromecast but the TV is on that input, it shows some really nice photographs and the time which acts as a screensaver. The best advantage of all is that Chromecast only costs $35. Chromecast is shipped with accessories you may or may not need, just in case. Google made a good decision by packaging everything you could need into 1 box and 1 low price. Currently there is a lack of app support that is the biggest disadvantage. However, since Google released the SDK, I’d expect the number to climb remarkable fast. Chromecast only supports 2.4 GHz Wi-Fi signals. Ok, I realize my geek is showing and that this is probably a very minor detail to most people. But for those who know about routers and how to speed up the access on your home network, 2.4 GHz vs. 5.0 GHz is a drastic difference. Also, if you have a dual band router, such as myself, you will have to change the Wi-Fi signal you are connected to if your device automatically connects to the 5.0 signal. Although, it is a nice advantage that the TVs input will change automatically when you select the Chromecast from your device, it’s a bit of a disadvantage that it doesn’t change the input back automatically when you disconnect your device from the Chromecast. I would love for the Chromecast to be able to connect to multiple devices at once. Imagine that you are having a party and you have some music playing in the background. But then your friend has this new awesome song he just wants everybody to hear. He could connect to the Chromecast with his phone and then cast that song, but only to disrupt the ongoing playlist. But what if he could just slide that song into the music queue right behind the song that is currently playing. I hear you could have been able to do that with the Nexus Q, but I unfortunately did not have the chance to play with one of those. Right now when you play music from Google Play Music, Chromecast shows the album art for that song/artist/album. It starts in full screen mode and then after 30 seconds or so it shrinks down to about 30% and bounces around the screen as to not cause burn in. But what if instead if played the most popular version of that songs music video from Youtube. Now you can enjoy your own playlists with the great videos at the same time during your party. Instant hit. Almost Smokey Bonesy atmosphereish. I shared this idea on Google+ and tagged +Larry Page but I haven’t heard anything back from him yet. Not holding my breath. 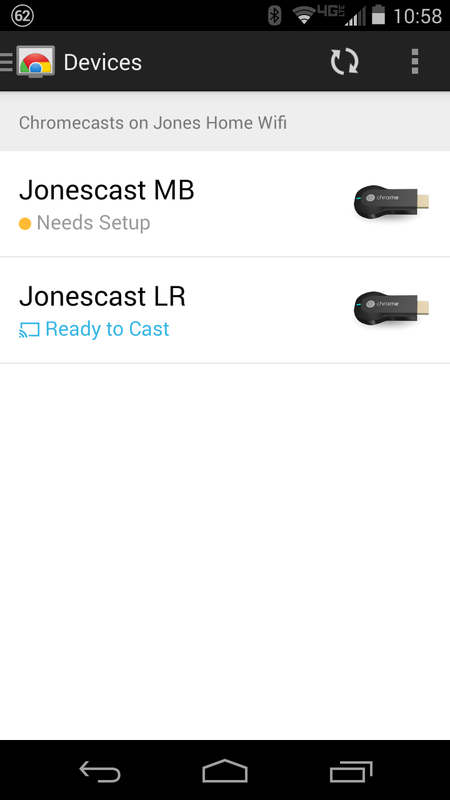 Is Chromecast for everyone? Of course that all depends on how you would use it. If you like streaming movies on Netflix, Hulu, or HBO Go then Chromecast will certainly making that much easier to navigate and watch. If you like streaming music while you party or even just do chores around the house, need the music to help you study, Chromecast will certainly help you out there as well. Some new apps are already out that allow you to share your home movies or pics for the friends and family from your device. This is a lot easier than passing the phone around or huddling around the device. If you are big into Youtube videos, Chromecast will definitely help you out. However, I’m having a hard time recommending it to my mother because she doesn’t currently have any subscriptions to movie services like Netflix or Hulu. She doesn’t watch Youtube on a regular basis. She likes listening to Pandora music, but she’s got a smart TV already which has the Pandora app installed. Of course if she had a Netflix subscription, that Smart TV has that app installed too. Now it definitely makes it easier to search while watching at the same time. So if she were to get a Netflix subscription, then adding the Chromecast would be an easier sale. But I think getting the Chromecast before Netflix in her case would be a cart before the horse scenario. On the other hand, my sister and brother in law are a great candidate for Chromecast. They don’t have a smart TV but do have a Netflix account. Making a playlist in Youtube of Baby Einstein movies helps keep their youngest occupied as she drifts off into a nap. Casting the music from Google Play Music allows their oldest and their cousins, my kids, to have a “dance party” when they spend the night. Chromecast is a great accessory to aid you in enriching the media that you already enjoy on the small screen by casting it to your bigger screen.